ESP Chod Leaders are designed to be used in conjunction with the incredibly effective chod rig presentation. Made using ESP Leadcore and including Leadcore Stop Beads and the specially designed ESP Chod Rig Sleeve plus a quick change clip link to hold the lead. Perfect when used with the ESP ready made chod rig, the top bead is simply removed before sliding the chod rig hook link on and replacing the top bead over the short section of silicone tube. The Chod Rig Sleeve acts as a streamlined sleeve housing the lead retaining clip link and the extended section of soft silicone tube provides a shock absorbing buffer when playing fish and also prevents the hook point from coming into contact with the lead on the cast. ESP Leadcore is highly abrasion resistant, extremely supple and leaders are spliced at both ends to give a streamlined joint with maximum breaking strain. 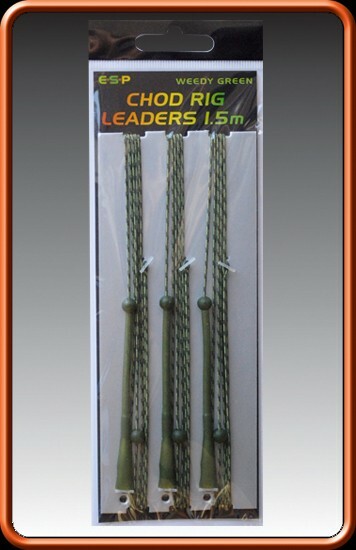 Available in Choddy Silt, Original Camo and Weedy Green with 3 leaders per packet in 1.0m and 1.5m lengths. The 1.0m leaders are excellent for long range casting whilst the 1.5m are ideal for short to medium range where the extra length helps to keep more of the terminal set-up anchored firmly along the bottom. The longer leaders are also ideal when fishing over thick weed where the top bead can be pushed right to the top of the leader resulting in the chod rig resting on top of the weed – a perfect presentation.